Grave : Plot IIIA. Row D. Grave 2. Thomas Andrew Fraser was a son of Richard B.G. and Janet S.S. Fraser, of Glasgow. On the night of 5-6 june 1944 he flew to Normandy onboard Short Stirling EF-295. The aircraft was hit and crash landed near Grangues. Four men died as a result of the crash, but seven survived. They were disarmed and taken prisoner by German forces in the area. Although the circumstances are unclear, at some stage during the night Lance Corporal Fraser, along with, Sapper Wheeler, Corporal Kelly, Lance-Corporal Branston, Sapper Wolfe and Driver Thomson, all of 591 Parachute Squadron, were shot. Sapper Guard, part of the Royal Engineers of HQ 6th Airborne Division, and glider pilot Duncan Wright were also killed. 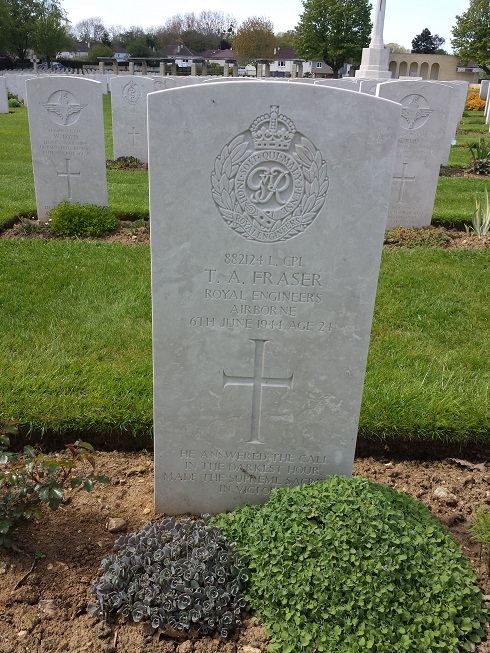 Frasers body was given a field burial a Chateau de Grangues. After a war crimes investigation his body was reinterred in Ranville War Cemetery.